We have all been waiting for last few months for Mohanji’s trip to London. The preparation was going on in full swing for the past many weeks. This period brought me very close to the Mohanji UK team, participating in the ACT foundation social service, preparation for the Guru Purnima and participating in most discussions and meetings with the team. This place now feels like family! Well, almost for a week, Mohanji is going to be with us in London, starting with the most auspicious celebration of Guru Purnima, Satsangs, Consciousness Kriya Initiation and finally the weekend retreat at Gilwell Park – an action packed few days. The wait is exciting! Many weeks of preparation for the much awaited Guru Purnima celebration with Mohanji in London. Finally, the day is here. Mohanji is here! We all got ready, arrived at The Bhavan, helped in the decoration of the hall in whichever way possible, with Vighneswaran Anna taking the full charge spreading his magic. Beautiful altar of Shree Ganesh at the entrance, powerful altar ready for Mohanji on the stage, the flowers, garlands, traditional Deepams (lamps) – even malli pu (gajra) for ladies!! The bright, colourful, sweet-scented hall filled with positivity already! It was a scorching hot day in London – 32 degrees Celsius! But that wasn’t any hindrance. All immersed in the ocean of positive energy and love for Mohanji eagerly waiting for his arrival in the hall. I was waiting at the door to welcome all other guests. And there he was, with his white Kurta and dhoti on with a couple of rudrakhsa malas hanging on his neck. With a bright radiating light on his face with a loving smile, he entered, looked at us and nodded his head with blessing. Speechless! The programme started. More than 160 people inside the extravagant, beautifully decorated hall, had taken their seat. Mohanji entered with a smile on his face showering his love and blessings on everyone present. Boys and girls ready on the stage to sing many shlokas, bhajans, which were just out of the world. The entire hall was filled with an elegant atmosphere of purity, peace and love. The bhajans sung by the children soaked with innocence, purity and love enchanted all. Everyone was completely immersed in the ocean of devotion. Mohanji came on the stage, sat on the beautifully decorated altar. What an image! Mesmerising. So powerful, radiating and filled with love for everyone. At that moment I felt like being immersed into him, being HIM, being ONE! Mohanji delivered his message for Guru Purnima – this event was being telecast live. “At this current time, all we need is a cleansing path. The method is; Contemplate on the soul – which is flexible, fluid, immortal, imperishable, indestructible, pure energy, pure consciousness. Connect to this! The shift will happen. Then all that is gross – the body, mind, intellect, and ego will start losing their grip”. Guruji’s message flew smoothly, everyone was totally engrossed! After the powerful and awakening message, there were many questions which were answered spontaneously by Mohanji. Then there was a very informative video played by ACT foundation – the charity organisation by Mohanji that runs all over the world helping needy people – providing food for hunger. Some heart-wrenching images of people in need and the selfless activities of ACT to help the needy people brought tears to eyes. This made everyone ponder on what Mohanji had said “We have received so much from this earth. What have we given?” Food for thought, indeed! After a short break for quick snacks provided by the ACT volunteers, the Q&A session resumed. As each question was put forward, Mohanji was just explaining more and more fluidly, deeply and the messages were flowing as if the sacred water was getting sprinkled over everyone! What a satisfying experience, such an enlightening message coming directly from a Guru of such stature. We were all indeed extremely fortunate. To conclude the beautiful programme, there was an elegantly beautiful Kathak dance and Tabla programme presented by Kathak Guru Padmashree Pratap Pawar’s students. There couldn’t have been any better conclusion to such a beautiful celebration! Mohanji’s appreciation for the artists came out in the form of his appreciation to Padmashree Guru Pawar when he presented him with a beautiful silk Shawl and hugged him so dearly. Getting the hug from Guru is getting immersed with the consciousness. Lucky are they! The much awaited day had concluded in a very satisfying way, everyone was filled with purity, sacredness and knowledge from Mohanji. I certainly was. This was the first event of the week Mohanji was going to be with us in London, many more events to follow – a Satsang, the Consciousness Kriya initiation and finally the weekend retreat with him at Gilwell Park. Much awaited Friday morning, full of purity and positive – a new birth for me. I am going to be led into a path of light and awareness blessed by the Guru himself. The hall where we were all gathered together waiting for Guruji to arrive had an amazing aura around, in a church hall, big colourful glass windows, with sunlight shining through, Guruji’s altar facing the East, as if the energy from Surya Dev coming directly through Guru’s hands to us. We were facing the shrine of God, facing the Guru. The atmosphere was so pure and consecrated. During the process as Guruji’s voice was swaying through our ears and mind, the feeling was as if we were in the Himalayas! That much power the Guru had, to create an atmosphere suited for the sacred process. Receiving the initiation from MY GURU & offering him dakshina has been one of the most sacred events of my life, as important as my birth from my mother’s womb. Prostrating at your feet my Guruji, let your blessing empower and enlighten my life in this path. The entire weekend with Mohanji was a blissful retreat experience! This is what was on everyone’s mind, almost 60 of us. I had a glimpse of this experience last year when I attended the Satsang on the last evening of the retreat last year at the same place and had recived Shaktipat. With an open mind, all were ready to get into any mould that Guru was going to introduce us to. Completely in surrender! Beautiful location, amidst tranquillity and serene environment, we all entered the sacred place. The evening started with Satsang with Mohanji. A lot of excitement and positivity amongst us, the childlike happiness was surging out of everyone’s face. The graceful Guru, as ever, had an amazing radiance on his face and the million dollar smile that can wipe out any misery in a moment. Agenda for next day was briefly discussed – intensified couple of hours, with a silent promise from Guru of relieving us from all impressions from the causal layer! The evening was concluded with a pious vegan dinner prepared by all volunteers. The retreat was also about harmonious communal living with everyone volunteering in chores in every way they could! No discrimination of race, colour, creed or gender. Under the assuring shelter of Guruji, all were one single family! The beautiful Saturday morning began with a bright promise, amidst the cool and clear atmosphere surrounded by greenery. While on my way to practice Kriya, I met Mohanji on the morning walk. What a blessing to get the darshan of Guruji first thing in the morning and that too before doing the Kriya the very first day after the initiation! I took his blessing and my heart was filled with love. Kriya was followed up with a Conscious Walk. A meditative walk that is 6 times more powerful than meditation done sitting at one place. The big trees with branches spread widely promising assurance. Birds chirping, rabbits playing around, morning sun with warm sunshine, this was indeed a promising morning. Sattvic breakfast was ready by the time we finished Conscious Walk and then gathering together to attend the Guru’s session. Here he comes, all powerful and equipped with grace to lead the 60 followers out of the bindings of karmic impressions and towards the path of light. Meditation began with the powerful Shiva Kavacha recited by Mohanji himself. It felt as if Shiva himself was around protecting us! Guru’s instruction followed. With closed eyes and focussed on Guru’s voice and instruction, mind was completely tuned and surrendered. After the first exercise came the first release process, “release all emotions inside – no trapping, no control, leave the ego, let the emotions flow” – th0se were the words. Almost everyone was propelling their emotions in their own way. And here it comes! My experience, the radiant vision in front of my eyes – a lotus flower and Mohanji’s smiling face in the center. Then came Maa Durga sitting on a tiger, then Maa Saraswati with Veena in her hand and finally Maa Kali! What a powerful vision this was. No sorrow, no tears….an amazingly calming smile with all white lights around. Then we started the next phase. This time Mohanji’s instructions reached much deep inside. All emotions came out as tears flowing uncontrollably making lighter and lighter. And finally, The Govinda Damodara Stotram was played. We were all mesmerised. Hands up, body swaying, mouthing reciting following whatever we could! The entire atmosphere was completely charged up! In the end, assurance from Guruji – a lot of release happened from most of us. The release process has started, which will continue for few days. Everyone looked tired after a very emotional journey, but surprisingly radiant look on everyone’s face indicating the energy circulation that had just happened! This was an experience beyond explanation. All were speechless but enjoying the stillness, calmness inside after storm! A much deserved break for lunch with delicious satvik Vegan food. And then conscious walk with the entire group. Amazing energy flow through the walk in the woods. Bright sun, beautiful scenery. By the time we were back, Mohanji was all set to let everyone click pictures with him. Just as a friend, he would make fun comments, tease someone, tap on the shoulder with blessing…who ever wanted whatever expression, they were indeed receiving that! And last but not the least – the group photo. A memory for lifetime! The mesmerising effect continued through the evening with further satsang, Q&A, Shaktipath and Aarti. After the dinner there was a beautiful and devotional ambience created with bhajans. It felt like the evening should continue for ever, this bliss should not end at all! Being greedy? Well, such was the taste of bliss! With a silent promise not to get the sadness show up, I practiced Kriya, followed by Conscious Walk, enjoyed the delicious porridge and fresh fruits and all set waiting for Mohanji to come and grace the satsang. Satsang began, some powerful question & answers! Lots of wisdom, eye opening ones! Message for children – Love and only Love. To end the satsang, with request, the Govinda Damodara Stotram was played. Most of us were swaying with the flow. Tears flowing out without any barrier, no control, no stop to the emotions. Urge to merge with the supreme consciousness was growing bigger and beyond. Vigneshwaran Anna started dancing, a true Krishna devotee, no hesitation, and no impediment. Pure love flowing out. Many of us joined him. The atmosphere was all charged up with pure devotion, love and surrender! What an end to the wonderful, out of world experience over last couple of days. Now it was time to receive Shaktipat from Guruji, the process of getting his grace and energy that has the power of removing all blockages from within and make us elevate higher! The Shaktipat was indeed powerful and took me to a completely different world! Finally, we concluded the satsang by offering aarati to Mohanji, a way to show our deepest gratitude to the Guru. That was not the end, the real surprise was the token of blessings that Guru gave all of us – blessed figurines to show us his symbol of blessing. We were touched by his grace, blessing and love. No words to convey the gratitude. Mohanji, needed to rush to airport to catch his flight – a long day ahead! I took the opportunity to sit near to him and exchange few experiences while he was having his lunch. Every moment with Guru is precious. Greedy mind won’t let him have his lunch quietly! But he is Guru, he is father, he is mother. He knows what this heart wanted. No sign of hesitation, now words of caution. He was participating in any discussions we were having, answering spontaneously anything that we were asking, listening to us carefully, everything that we were uttering. Such is his love & affection to us, never diminishing! Finally the time came, Mohanji had to leave. The retreat programme had concluded. Heart was content with what we received in last few days, but it was still heavy bidding him good bye. With a hope of seeing him again next year and the promise to follow his teachings, we all returned home. The bliss stayed intact! For many more days to come! In my life I tried many times to look for a True Guru but every time the search was in vain! One day, I said to my husband, Kamal, “Now it’s useless trying, it does not seem to be that we will find our Guru in this lifetime and we may have to leave this current life without finding one.” Well! God had other plans this time. He heard our prayers and showered His Grace on us! I have two daughters – Richa and Kanika. Those days my elder daughter was living in Pune. One day she called me and asked me, “Mumma do you know that Sumit bhaiya has a Guru?” Sumit is my nephew. To this question I replied in the negative. Then she told me that she had read a post from Sumit on Facebook that had a mention of a Guru. After our phone conversation, Richa immediately called him up and asked him if he had got a Guru to which Sumit responded he had. Richa asked Sumit why he hadn’t mentioned about his Guru to her parents – meaning to me and my husband, as we had been searching for a Guru for a very long time!!! To this Sumit replied, “Maybe their time hadn’t come and at the right time, they would naturally get to know!” So, time kept passing by! In the meantime Richa got pregnant and she was advised bed-rest due to some complications. Then she spoke to Sumit. He assured her that all would be well. He comforted her that her problem would be resolved and that she should receive Shaktipath from his friend named Manish who is a shaktipat initiate of Mohanji and was located in Pune, too. Richa coordinated with Manish and he came to her house to give her Shaktipath. This was my first experience of Mohanji before meeting him. One day I called up Sumit from Pune and told him that I also wanted Shaktipath. Sumit said that Manish would come to give the Shaktipath. One week later Manish came to Richa’s home and gave me the Shaktipath and also shared with us some of his new experiences with Guruji. After this I did meditation at Richa’s home every night. Time flew and after one month I came back to Jammu. I continued my meditation practice there. One day, I was alone in the afternoon and I thought to meditate. As soon as I sat on the chair and was about to start the Power of Purity CD, a doubt came to my mind as to whether I had taken the right decision to make a Guru and that maybe I should have cross-checked thoroughly before doing so. Immediately, in a loud voice I called out to Mohanji and said that if He was a true Guru then He ought to give me a sign. The moment I uttered this, my chair shook strongly as if somebody held it from behind and shook it. At first I thought this is the sign from Guruji but the next instant, my mind continued to doubt and thought I must have imagined it. I requested again for a sign. After a while, I heard a loud cough and I thought this was the sign yet my doubtful mind wouldn’t believe. So again I loudly said, “Not like this Guruji, give me a solid proof.” The moment I asked for this, I was stupefied to see that Guruji manifested himself before me and sat cross-legged on the floor, He was wearing orange clothes, I just couldn’t believe my eyes!!! And then he vanished and I was left completely bewildered! After a while I came to my senses and thought Guruji had indeed given me a solid proof. Or was it my mind’s illusion? The next moment I thought that I should message Him and ask. Immediately I messaged Him and asked, “Guruji, were You here?” and He gently replied, “How many times you tested me, even now you can’t believe?” How my mind played the doubting game! Can’t express the depth of your compassion!!! We had our first retreat with Guruji at Patnitiop in Jammu. After the retreat, the plan was to go to visit the shrine of Mata Vaishno Devi. We reached Katra at noon. Initially the plan had been to take the helicopter but due to fog it had to be cancelled. Guruji and other devotees were ready to take the horses but I am too scared of them and was unwilling. I have always been scared of riding horses. Another lady and I decided to take the palanquins instead. There were only a few available as the palanquin guys were on strike and so we couldn’t get any. Meanwhile, the rest of our group including my husband Kamal , went ahead and began the ascend. Both of us ladies tried a lot to get a palanquin but we didn’t succeed. Time passed and it was 6pm and then we too thought of taking the horses. We told the horsemen that we would reward them if they ensured we had a smooth ride uphill. We did reach safely by Guruji’s Grace. That night when we were all sitting around Guruji, I said to him, “Guruji today the helicopter didn’t work, but tomorrow we would surely go back by helicopter.” Guruji laughed and replied, “We will go back on the four-legged helicopter, now only half of your fear has gone, the remaining half is yet to go.” On hearing this I became sure that the next day we would go back on the horses again. When we woke up the next morning, there was dense fog, but it cleared the moment, we paid our respects at Divine Mother’s shrine. We all got on our horses and went towards the helipad. The chopper was ready to fly but the moment we sat inside it, a blanket of fog enveloped us and the helicopter couldn’t fly. We all sat and waited for an hour for the weather to clear but when that didn’t happen, Guruji asked us to take the horses. Then I recalled what He had said earlier, “We will go on the four-legged helicopter.” This is the divine play of our beloved Guruji and then we got the horses and started our ride down. By His Grace, Guruji’s horse and my horse trotted side-by-side. While we were going down, my knee brushed past the knee of another person on a horse and my knee was hurt badly and it pained so much that I was unable to continue sitting on the horse! I felt like getting off the horse but after some time, the pain in my knee totally vanished. This was indeed a miracle! When we reached half-way through, I asked Guruji to have some water and we both got down from our horses. When Guruji tried walking He was unable to. When I enquired of Him as to what had happened to His leg, He answered, “Nothing, the knee is aching.” After having the juice we resumed our ride down. Guruji was walking with great difficulty. That right leg and knee of Guruji was aching on which I had suffered the injury, His play is incredible, He had taken my pain on Himself. When I asked Him why He had done so, he smiled and responded, “It would have taken 8 days before your pain would have been relieved, my pain would be gone in 8 hours.” This is the nature of a True Guru who is with His devotees at every step. One day when I sat in the Puja room of my home, my heart instantly swelled-up with deep love overflowing for God and in that devotional fervor, I said to God, “Why don’t you come to me, I have been longing to meet You for so long, I want to hug You today, You will have to come today.” And I began to cry. While crying, my eyes fell on Guruji’s picture and I started crying more and more loudly. I said to Guruji, “You too have gone so far away, I am missing you a lot too.” Guruji was away on ‘World Tour’ those days. I went on, “Today I feel like hugging you tightly. You will have to meet me today.” I had just uttered these words and my grandson, Vedant, who had been bathing, quickly came out of the bathroom and started hugging me and kissing me which was very unusual. When he touched my eyes, he said, “Grandma, why are you crying?” I was speechless on seeing such outstandingly quick response of my Guruji who used Vedant to comfort me. Vedant wiped off my tears and asked me again as to why I was crying. I told him that I was missing my Guru. He replied, “Grandma, don’t cry, we will go right away to meet your Guruji.” On hearing this, I hugged him tightly and it felt to me that I was hugging Mohanji and that He in turn was reciprocating. Such is the Divine play of my dearest Guru! That night and day, I worship Thee! On 23rd Feb 2016, there was a birthday celebration of Mohanji at both the schools in Jammu. First the celebration was in “Mohanji ka Aangan” and then in the second school. Once the function was over in the second school, then Mohanji sat there for some time. I had got a gift for Guruji but was unable to decide how and when to give it to Him. I desired to give Him the gift at my own home which he had no time to visit because of his busy schedule. Then I thought that I don’t need to think too much and that Guruji would show a way. Then Mamu asked Him to hurry a bit as they all had to reach somewhere else. At that time, Guruji was accompanied by Rajesh and two other people. Since my home was en route to their destination, I requested Mamu if they could drop me. Mamu told me if there was space in the car he would accommodate me. I had full faith and knew that I would go along in the car with Mohanji. Suddenly then Mamu asked me to sit in the car and while I was thinking about giving the gift to Guruji, we had reached my house. Guruji suddenly asked Rajesh if he had seen Guruji’s picture in the Puja room of my house. When Rajesh mentioned he hadn’t, Mohanji asked him to go and see it. At that instant, I humbly requested Guruji to put a foot inside my home and bless it. Guruji laughed and good-humouredly responded, “I don’t have one foot but two, I will put both” and then he got down from the car and came inside. Everyone else too came in and while they were looking at the picture in the Puja room, I gave the gift to my dear Guruji and thus he fulfilled my unspoken wish. This is an example of faith and surrender and the associated fulfillment. When we surrender fully, then faith develops and when we develop faith, surrender automatically happens. I would like to share an experience during the days when I was learning Yoga from Sanjay sir. Once we were practising pranayaams, “breathing exercises for expanding prana”. While we were doing the breathing, we heard some loud breathing and it seemed to be in rhythm with our breathing. Once we were done, Sanjay sir commented that I breathed very loudly that day, I denied this saying that instead I thought it was he who was doing so. Since it had not been either of us, then both of us burst out laughing as it dawned on us as to who had been in our midst. Mohanji looks after us always and he proves it time and again to those who have deep faith in him. He loves fun. At times, Guruji performs playful lilas with us. Like Krishna, my Guru’s play is wonderful as well. Once when we were practising Yoga in the evening, Sanjay sir’s attention was drawn to the flame of the lamp that we had lit. While doing Yoga, first lighting the lamp was a practice that we followed. Sanjay sir took out his mobile and clicked a picture. When I asked what he was doing, he showed me the picture of the flame, I was astonished to see that in the center of the flame, there was a red and black colored-heart. We took more pictures and this was visible in each one. When I went back home and clicked the picture of the flame of the lamp lit in my Puja room, that too had that same red and black-coloured heart in the center. To verify this, I tried clicking pictures of the flame of the lamp of my Puja room, the following day, but then the heart could not be seen. Again, Mohanji displayed his presence and love for us. Unconditional love, only unconditional love! When Swami Bhaktananda Bharatiji visited Jammu for the first time, then he did a “hawan” – fire purification ceremony at our home, post which he asked all of us to meditate. During the meditation, he gently asked everybody what they were feeling. Each one responded but I was sitting still. The moment he asked the girl sitting next to me, she instantly burst into tears; I started to laugh loudly, very loudly. I was unable to control my laughter and continued laughing. After five minutes, somehow I gathered myself and stopped. There had been no reason for my laughter. Due to lack of time I was unable to ask Swamiji how and why my spontaneous laughter had happened. The next day as I logged in to Facebook, the first post I saw was of Guruji and it was on “Causeless Laughter” which he had explained in detail. I had received my answer! He always hears our heart and gives answers. If only we listened! O SatGuru! Let Thy Love, Peace and Joy blossom in every heart and eliminate all hate-thorns! Before all, I want to thank our Father Mohanji, then I want to thank a certain group of people who made this all possible. Many of you do not have any idea what challenges they were going through. It was going on for months and it was not at all easy. I had a chance to experience the retreat when I was not a part of the retreat and now when I am a part of it. I thank Spahovic sisters, Maja and Sanja. I also thank those who assisted me, Brane, Matija, Martin, Bilja, Spomenka, Nina, Monika, thank you all. As for my experience, briefly, I felt something like this on Andrevlje in Serbia, in Bosnia and here, too. It is difficult if not impossible to go through this at home with various practices. I am grateful for having given to us this self-realising mantra, Om….etc. It is an unbelievably deep technique for me. I really did my best while I was doing it. At one moment I lost the feeling of my body. I had a feeling I was levitating. After that, some unbelievable emptiness and peace. Also unity – I really felt deep unity. At that moment nothing from the outside could touch it and I still keep feeling it. Of course, I had various reactions along the way, sometimes I was a bit louder, sometimes quieter. Anyway, it is very important that each moment I felt deep peace and deep connection with myself. People would say,“You are irritable now.“ Yes, I expressed this, but it was all on the surface. Each moment of my anger I was deeply connected to myself and stressful situations could not touch me. Also, at the moment of deep peace, deep emptiness, that tremendous space that is within us… I think my heart chakra exploded! It was a huge hole, or how else to call it. I think this is my eighth or ninth retreat and each retreat I am born again. Each retreat this is new Milos, new Milos, new Milos. Unbelievable. It is such a tremendous power when you can flow through life in such a way – that whatever happens on the outside cannot touch you. Of course, there may be disagreements, but nothing can touch you because you are deeply connected with yourself within. Absolutely nothing. It is an unbelievable power. Mohanji (was in Croatia at that time): Sri Vasudevan is unwell. He may leave his body soon. I spoke to him. He said he do not want to be admitted in the hospital and want to leave his body in the temple at Bhagawan’s feet. Madhu is travelling to Vajreshwari as we speak. Dr. Gajanan is already there. He said he always thinks about me and wanted to hear my voice one last time and his blessings are always with me. This was so touching. Madhusudan Rajagopalan (was with Sri Vasudevan in Vajreshwari), “Swamiji is not ill, he’s just weak and says he doesn’t want to be around for long… he’s fully in control. We just left from Vajreshwari, conveyed pranaams from everyone. He was very happy to spend time with us. Jeanetta and Dewa, who manage Fire Mountain Retreat, a centre near Gareth puri, first met Swamiji in March when we conducted ‎our Weekend program with Mohanji at their venue. They visited him every day since last week and paid their respects to him. “We have great gratitude for being invited to visit beloved and super respected Vasudev Swami … it was such a joy and blessing to receive the darshan of this holy man experiencing the bliss of his faithful service and and his impending transition to glory. Mohanji’s loving presence saturated the house during the time while we were there. We brought an orange cloth that had wrapped Bhagwan Nityananda’s murti and flowers blessed at the samadhi shrine. We honoured and shared these gifts with Vasudev Swami for empowering his journey home. Jeanetta and Dewa, “We have just returned from the burning ghat as well as the house and shrine where Vasudev Swami lived. The man tending the cremation fire is very kind and respectful. As we stood at the ghat, chanting Triumbakum Mantra for our Dear Friend, one of our Trust’s staff members drove up. He speaks English as well as Marathi and Hindi. Then, as we talked, two more men drove up. One man had been sent by A Dr. Amberker, to collect the ashes. We were told this man would collect the ashes and deliver them to Dr. Amberker who was planning to take them immediately to Nashik tomorrow. Half of the ashes were to go to Nashik, and half to the River Ganga. Mohanji wrote, “Vasudevan Swami of Vajreshwari left his body at around 11AM IST today. I still remember his words when I bid good bye in March 2016. Unlike other times, he came out of the temple to see me off. He had tears in his eyes. He said, “Remember two things. There is not even one day that I do not remember you. And remember Bhagawan Nithyananda is always with you. Worry not. You are always protected.” I bowed down and left. I told Kamath who was with me, “This seems like a final good bye. I may not see him again.” He merged into eternity today morning. Given are the pictures of his decorating me with a shawl. Swami Vasudevan was decorated with a sacred shawl by Bhagawan Nithyananda’s devotees. The shawl was offered to Nithyananda for consecration. Swami Vasudevan was wondering what to do with this gift. Bhagawan told him, “Give it to Mohanji.“ He thought,“How will I meet Mohanji? Perhaps he is not in India. Bhagawan brought me to him last evening prior to our retreat in Ganesh Puri. He decorated me with the shawl. Divine Leela. What else can I say? Totally humbled. While parting he told me,“One thing I am sure and shall tell you. Bhagawan Nithyananda is with you always and will be with you forever. I have no doubt. Trust me.“ His bhaav was overwhelming when he said that. He said, “Never be afraid of adversities. Your existence has purpose. Purpose is much larger than any adversities of existence.“ It was almost like a grandfather blessing a grandchild. While parting he also said,“Not one day goes by without me thinking about you. I remember you every day.“ In the myriad world of misunderstandings, this one understanding is worth the breath. Humbled. Grateful. He was powerful. Deities visited him at his mere call and left their residues on the wall for visitors to witness and perceive. Life does not end. Only body ends. Madhusudan Rajagopalan, “He passed away peacefully in the Nath mandir as he wished. His last rites were done in the afternoon. We are planning to collect his ashes and consign them to the Ganga. When we met Swamiji last week, he asked us to do a bhandara (food seva) in Ganeshpuri in his name. We will coordinate and do this via Ammucare in the coming days. Narendra Bhandari: “I had the opportunity to seek his blessings on 29th March 2015. Rest in peace swami Vasudevanji. The picture of his footsteps after concluding the prayers at samadhi in the backyard of the Temple. Mohanji: We shall fulfil all his wishes as he told us including Annadaan in his name. We shall distribute his picture also along with food so that all those who can bless him. We shall immerse part of his ash in the river nearby Vajreshwari and part in the Ganga. We shall do this in July itself. I’ll tell you a real story. I always visit this place near Bombay. There is a small room with the presence of Bhagavan Nithyananda, and two Nath Gurus, Machidanath and Gorakhnath. An 84 year old man, Vasudevan has been serving in the small temple for many years. He just washes the place and keeps the deities ready. People rarely visit the temple. This man is unbelievably powerful. One day somebody gifted him a book in English about Bhagavan Nithyananda. He wondered, “What will I do with this book?” And in the evening Bhagavan Nithyananda came to him in a dream or in real, and said, “Give this to Mohanji.” He asked, “How will I meet Mohanji? He is always out of India.” Next day I reached there. He said, “Yesterday I was thinking how to see you and you came.” I said, “You were not thinking. You were pulling me! HA HA.” I was there during Kumbh Mela in September. While I was sitting there, Hanumanji was meditating in the temple. 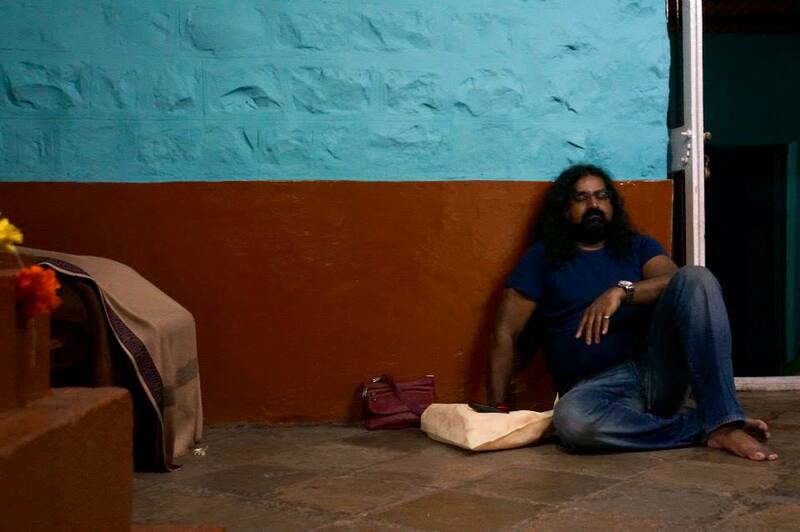 He said, “You know, this is where he was sitting.” And there is an impression of Hanumanji on the wall. This time when I went, he could not even stand upright, he was bent. He was taking a bucket of water and cleaning. I asked him, “How are you lifting it?” “No, no, no, this is ok, I am serving God. I have no pain.” I know that he cannot walk and is full of pain. There is sacred ash emerging there. He keeps all the ash, and if any person with any ailment goes and says, “Please pray for me,” he will use the ash and it’s guaranteed to heal. I sent many of my followers there just to demonstrate to them what devotion is. Masters come to you not for the countless chants but for the purity of your heart. Mohanji: Why are you still wearing the torn ones? Where are other ones? Vasudevan: Mohanji, don’t send me good clothes, I was afraid to look at them, because if I wear all these, people will think I am a rich man. You take it. This time also he gave me a lot of clothes. Mohanji: Don’t give me all these clothes, I have clothes. Vasudevan: No, I kept them for you, take it. Mohanji: I can’t take all these clothes, there are too many. Mohanji: What will make you happy, if I take all these clothes, or if I leave it? Vasudevan: If you take all these clothes, I’ll be very happy. Mohanji: Ok, then give them to me. There are various people like him but not visible to us. You cannot estimate the power of a master because if you start analyzing, you lose him completely. When I told the story of Dipaka, I suddenly remembered this man. Unfortunately after his death, this temple will probably also wither away, unless someone with understanding and selflessness takes over with commitment. If you just tell him my name Mohanji, he would start crying out of deep affection – there is so much love, he doesn’t know what to do. I met many masters like him but they are not in the public light. You hardly see them, but if you want to experience real love, you have to meet such people. Apparently, this is the very location where the great book Nath Rahasya was delivered to human kind. Finally we left the Ganeshpuri premises for Vajreshwari another 3 kms towards Bhiwandi and went straight to a Nath temple. From the main road one cannot easily find the temple. This is also a very powerful place where Bhagwan Nityananda would often sit and meditate. There are padukas of Maschendra Nath and Goraksha Nath of the ancient Nath tradition. The priest of the temple who is very old and frail looking told us that both Maschendra Nath and His disciple Gorakhsha Nath did penance there for two months to appease the Goddess and that the spot is very sacred. Bade Baba later converted that into a temple. The original padukas of Bade Baba are also there at the altar. The priest is a great Bhakta and very saintly. He mentioned that it is not possible for ordinary people to reach there as the devatas there do not permit the same. This place lies well hidden and only those who are truly “invited” can reach there. The priest also is not just a priest, he is a great saint, but totally unassuming. He has the power to manifest any God at will. When he saw Mohanji, he asked him to stay with him or at least have food with him, which he would willingly cook for Mohanji! 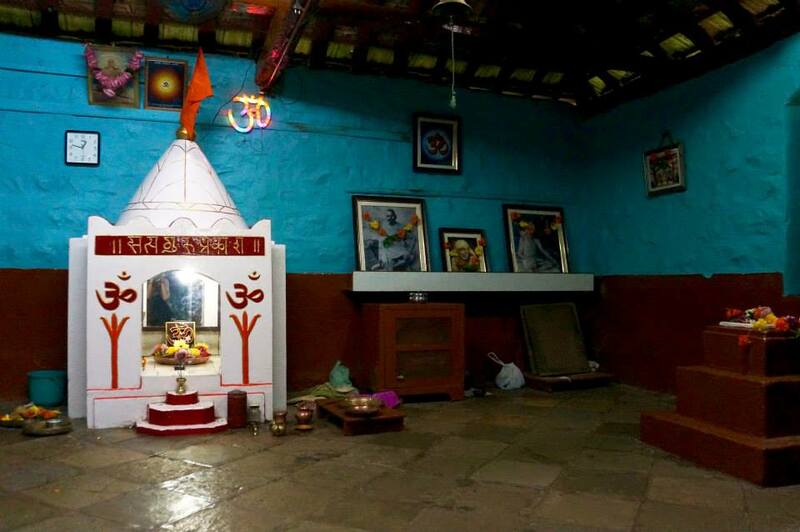 Many visit Vajreshwari Devi temple across the road or even Ganeshpuri but rarely somebody visits Nath temple, because it is not visible at all. This saint is deep into Bhakti and is totally established at the being level. He does not do any great spiritual practice. He is a saint and does not even realize that He has great powers. I have met Him several times before and always felt so, but never saw Him exhibiting any powers, just like any true saints who will never display any siddhis. He is very pure and humble. He has had darshan of all Deities, Gods and Goddesses inside the temple and He showed their impressions on all the four walls of the temple to Mohanji, with a lot of enthusiasm. He also mentioned that if the inner eye is not open, one cannot even witness the residue left behind by the great Avatars, Gods and Goddesses. He had Bhagwan Nityananda’s live darshan several times there. Outside the temple in the garden there is Samadhi of Swami Ram Teertha, another disciple of Bade Baba who was asked by Baba to look after the temple before this priest. In fact the priest told us that Bade Baba gave His padukas blessed by Him at Kailasa to Swami Ram Teertha to place in this temple and worship. We all did pooja here and the priest blessed us with the udi (sacred ash) of all the three energies. He mentioned that the udi is very powerful and bestows one with all the achievements in life! Mohanji bowed down and touched the feet of this saint which was very touching! We all touched His feet. Mohanji later revealed to me that God sent me there to the Nath temple to have darshan of this saintly priest who is so pure that He does nothing except devotion and always stays at the being level. All Gods, Goddesses and Deities come and give darshan to Him while we are busy doing some or other sadhana to fill our space and evolve spiritually. We go to temples and holy places searching for God. While Gods visits this simple man! This is the truth of spirituality one must clearly understand. All you have to do is increase eligibility through being-ness and nurturing purity within. God will guard you. Mostly we seek God and do pilgrimages to have Their darshan but its special and different when Gods come to us and give darshan. We should elevate our purity to that level in non-doing mode i.e. at being level by constantly being aware of each moment of our lives. The saint told us many stories that he had encountered in the temple and was reluctant to let us go. It was so homely for Mohanji too, as he truly belonged there. While we were leaving, the saint was standing at the door and waving at us until we moved away from his vicinity. We felt as if we were leaving our own home and our parent was wishing us from the door step. This is the beauty and bonding of our Tradition. The Tradition never leaves your hand and it comes around as reminders whenever we walk away from it. Then we left for the darshan of Vajreshwari, Renuka and Kalikadevi at an ancient temple on the little hillock. After the darshan we bowed at the Shiva temple there as well as the Hanumanji temple. On the right side of this temple at the back is the Lord Dattatreya temple under the only Rudrakasha tree with pictures of Bhagwan Nityananda, Swami Muktananda, Swami Ram Teertha and Sai Nath of Shirdi. The priest at the Nath temple told me that Bade Baba would sit for long periods at this place as well. Dhritiman Biswas: In the early 2014, I went to meet Sri Vasudev ji near Ganeshpuri (Maharashtra). I had already met Sri Vasudevji the previous year. We talked fondly about Mohanji. He remembered Mohanji’s visits to this Nath temple with a twinkle in his eye. He showed me Mohanji’s eye cards and a printout of the blog on Mohanji’s universe about him! He asked me to translate the blog and smiled as I read it out loud. He also enquired about Bibaji and Mila. A dhoti was presented to him on behalf of Mohanji, at his lotus feet. I would like to share my experience during the visit to Ganeshpuri on our way back from Nashik. Mohanji said he would like to spend time with Vasudevan swami (a highly evolved saint at the Nath mandir in Vajreshwari). He asked us to proceed to take darshan at Nithyanand Bhagwan’s (Bade Baba’s) Samadhi and meet him back at Vasudevan swami’s place. It did cross my mind why he did not want to come to the Samadhi mandir after coming all the way to Ganeshpuri. We dropped Mohanji at Vasudevan swami’s Nath mandir opposite Vajreshwari temple and went to Bade Baba’s shrine. 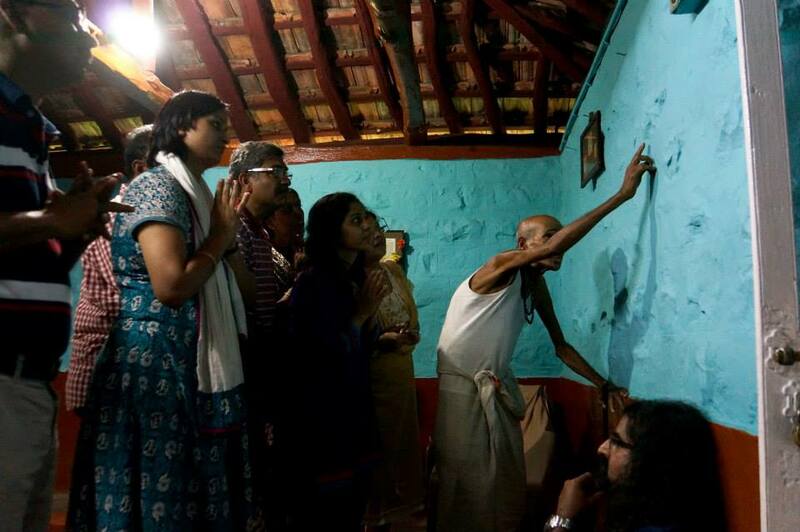 As our group had a couple of first timers we went to Kailash Bhavan first to show them the place where Bade Baba used to live. We sat opposite his chair and meditated for some time. The place was as powerful and full of energy as it always is. Numerous devotees have felt and seen Nityanand Bhagwan in and around Kailash Bhawan even to this date. I have had the grace and good fortune of having his darshan too on one such visit. I will write about it separately some other time. There is a room opposite the bath tub which is sometimes open to visitors. This was where Baba used to sleep. The last couple of times the room was open and we got in and meditated there for some time. I tried to open the door but it was locked. I put my head on the door and peeped in and thanked Bade Baba for this darshan when I got a very strong fragrance of vibuthi once again coming from inside. I instinctively recognised it as Mohanji’s fragrance, the same one I got at the snaan. As I kept my head there I also got a strong smell of sandalwood and after a while I could smell other multiple fragrances coming from the room. Madhu, Nikunj, Arusha and Vidya each put their head there, smelt the fragrance and their forehead began to pulsate as the energy inside was very high. Every single one of us were amazed! At that moment we knew Mohanji was inside with Bade Baba and I felt a couple of other masters were there too. We then went to the Samadhi mandir right in time for Aarti and needless to say the darshan was magical. We left after the Aarti without waiting for the Prasad as others in the group would be waiting for us at the Nath mandir. Once we went there I saw Mohanji and asked him what he was doing at the Kailash Bhavan? To which he replied with the same twinkle in his eyes that he did not have to be physically present at Ganeshpuri to take darshan of Bade Baba. He also confirmed there were a few of them there at the room. It was an amazing moment for me as a reconfirmation of how one’s own experience cuts out the doubts set forth by the mind. By the end of our trip I understood that what we see physically is a miniscule of Mohanji’s stature and presence. I remember what he told me when I met him at the Mumbai centre, “Try to understand me then you will never leave me”. My single prayer to him is to help me understand him, as I would never want to leave him ever and I pray it always remains that way. I would like to share the most memorable visit to Vasudevanji. My one last wish was to visit the holy saint Vasudevan in Ganeshpuri. And since my flight was at 3.30 PM, Mamuji said that I might have to cancel the Ganeshpuri visit, as I would miss the flight otherwise. I was sincerely praying that I would get the opportunity to meet Vasudevanji. And not surprisingly, I had enough time to visit this saint along with Mohanji. The visit was so amazing. Vasudevanji was an epitome of humility and a normal person can just pass him as another human being. I was just not feeling like coming out of the house, by which time, Rajesh and Mamuji started calling me saying I needed to hurry or I would miss my flight as it was already very late. After taking the blessings of my Guru and Vasudevanji, I hurried towards the cab to get my luggage. At that moment, I got a call from an unknown number, which I didn’t intend to pick, since I was terribly late, but somehow picked it to know, that my flight was delayed to 4.20 PM. Phew!!! What a timing… Now I had enough time to reach airport on time. What grace and unconditional love Mohanji is!!! Sheer joy and I was almost ready to jump of happiness. I bid goodbye to Mamuji and Rajesh and the entire group with a heavy heart. I was indeed able to make it to the airport on time.  Miracle after miracle is what I saw in this trip. In conclusion, what I learnt from the entire trip was – have the best intentions and surrender to Lord – Things will definitely turn out well. My sincere gratitude to the entire team and fellow travelers. I stood on hallowed ground. I was one of hundreds if not thousands of pilgrims that day; all of us queuing to visit the Samadhi of Sai Baba. This place, the town of Shirdi in the Indian state of Maharashtra, has been sanctified by the presence of the great saint who lived here for more than 70 years. As an ignorant person, I am hardly qualified to venture an opinion on any Master, but if love is any indication of the stature of a Master, then He must have been a very powerful. In this place, I feel so much love, such a mighty presence that I almost drown in it. It was Thursday the 9th. Thursday is Baba’s favoured day and 9 is the number of the Dattatreya Tradition, the number which represents the changeless. This was no coincidence, it was Baba’s doing. They say no one comes to Shirdi unless Baba calls and no one leaves until Baba lets you go. Why did I come here? I came here to work in a Vegan restaurant, the first of its kind in Shirdi. I believe strongly in the necessity of cruelty-free food and at the same time I am building a career for myself as part of a dharmic business. That is the long answer. The short answer is that I came here by Mohanji’s grace. To my joy, Mohanji arrived in Shirdi a few days later and shortly after that another Master named Avadhoot Nadananda arrived as well. I had heard a few stories about Nadanandaji and was excited to meet him. He is the pontiff of the subtle realm of Shamballa, in the same lineage as Sai Baba who had been the pontiff of Shamballa in his own time. He is also the current leader of Vidya path. I expected a stern, intense man and when I met him I did indeed find him to be intense, but gently so, lovingly so. I have seen Mohanji play many parts, this time I saw Mohanji the disciple. In Nadanandaji’s presence he positioned himself simply and humbly. He prostrated at Nadanandaji’s feet, deferred to him, spoke little and treated him with utmost reverence, but not for a moment did Mohanji handle himself meekly or shyly. Here was a regal humility. There was power and nobility in his humility. Never let Mohanji’s humility fool you, never take him for granted. Master’s the world over are recognizing him and urging us all to hold on to him for dear life. They are giving him titles to help us recognize what he is (not that Mohanji himself cares in the least for titles). Mohanji’s presence is an island of solace in the tempest tossed ocean of life. So, I found myself thrice blessed; by the presence of Mohanji, of Nadanandaji and of Sai Baba who is so palpable in this place. They had come for the inauguration of 2 restaurants; the vegan restaurant and a sattvic restaurant; both of which are owned and run by the same team and are in the same hotel. The chief priest of the Shirdi temple, Sulakhe Maharaj, also joined us on the day of inauguration. This took the form of a few short rituals after which Mohanji and Nadanandaji both gave a short talk. As with many things which happen in life; it’s very easy to take these kinds of occurrences for granted. Shirdi is after all just a place and Mohanji just a man the same goes for Nadanandaji. All that really happened was that some people got together and performed a ritual and talked. But if we stop for a moment to look at the subtler side of things, we might see the coming together of giants of consciousness, heroes of the spiritual world. Sai Baba and Mohanji and Nadanandaji all have different names and forms and in my mind the image of each is distinct, but what I feel is so different. When I put aside the image, I see only one: One enormous, bright powerhouse of energy, radiating love and grace like the sun. Behind what we call Mohanji is something vast and beautiful, well beyond our capacity to understand, but not beyond our capacity to feel. For me, questions of deserving aren’t even worth contemplating. The presence of a Master like Mohanji in my life, the experiences he has delivered and the events that surround him and which we witness, are gifts of Grace; Pure And Simple. Love; Pure And Simple. One night I was sitting in my bedroom and started chanting Mohanji’s Gayatri Mantra. After several seconds I realized something was different… I was feeling younger and younger and younger, as if time went backwards. I began chanting as I was in my thirties, then I transformed into myself when I was in my late twenties, then I became 18, 15, 10 years old. I kept on chanting while this transformation was happening. To be clear, I can’t say that I saw myself as a younger girl, it wasn’t a vision, I actually became this girl, I was step by step turned into myself 10, 15, 20, 25 years ago… My consciousness travelled through my past. This was so vivid, and even feelings, emotions, perception of my life were changing according to my age. I travelled through my whole life, recognizing and recalling myself at every point in the past. Although there was a difference between me at different ages, I felt that this Gayatri Mantra was something that connected everything. It was like a base in my life. I sensed it as a string that went through all the stages of my life, it was always there. I realized that all these years since I was born I had been emanating the vibrations of this mantra, without even knowing the words. I didn’t chant it as it is, but somehow I was producing the same vibrations that chanting of this mantra creates. These vibrations were like a thread, and my personality at different ages was like some beads on it. And holding on to this thick thread, I travelled into my past, going through these beads or my different ages backwards, until I reached the first day of my life. While I was traveling I figured what exactly were these vibrations about. I realized the meaning, the core of the Mohanji Gayatri Mantra, which I was being produced without even a sound, without even a single word. I realized … I was just calling my Guruji. Since I was born I have been calling him, sending my message to the universe, sending my call to Him. I started crying when I finally understood this truth. Meanwhile, I kept on chanting… When I reached the moment when I was born, I saw myself as a baby and in the area of my third eye I had a crystal in a form of rhomb, and a huge blue-crystal ray of light was coming out of it. I knew it was the ray that was supposed to give a signal to Mohanji that I was born in a new body. The ray of white and blue light went out to the universe announcing my dear Guruji that I was there. As I was deeply immersed into the feelings of this newborn baby girl, I again experienced all the frustrations and emotions: in the first seconds, minutes, days of my new life. I was crying, looking for Mohanji, and I was so desperate not being able to see him. I was calling Him, looking for Him as a baby, as a child, as a teenager, as an adult… my whole life I felt I was missing something/someone. And finally that night when I was awakened to this knowledge, I remembered everything. I remembered what I had been missing and who I had been calling since the first day of my life. No separation anymore. Always in your Consciousness… Forever One with you. The retreat began with Mohanji reiterating as always, to bring the focus of our attention on the feeling. Feeling is crucial during the retreat, not sight, smell, mind’s games. Feeling has real effect. Sanjay Sir asked Mohanji today, “When will you shift gears?” He laughed and replied, “When people come out of water” and continued, “Most people go away from home to relax. We take a decision before we leave: I’m going to enjoy. Then it becomes a big pressure in the head. It is a pressure for pleasure and it makes you tired. Let us not be pressured for anything.” Once he estimated the energy and spiritual needs of the group, he added the customised schedule to be covered, the intensity which was going to best suit the group and possible physical and mental effects of cleansing. I decided to be feeling oriented without pressure for upliftment or any other experience. I just intended to stay connected as deeply as possible and be in my heart. Day 2 was the first full day program. Initiates into Consciousness Kriya including me began our morning practice in the auspicious Brahma Muhurta hours. Then the whole group had a 2 hour Yoga session with Sanjay Sir. The first Yoga day started with easy exercises and postures so that the whole group could slowly get used to it. Simple to understand and do, as per Traditional School of Yoga – including even jogging simulation to boost circulation, the session ended happily with loud, unrestrained, boisterous laughter. I could feel the depth and level of silence inside. The echo of this laughter helped me to laugh and cry more freely and loudly, penetrating deep into my system. After Yoga we had a refreshing, fulfilling, confusion dispelling, soul addressing Q&A session by Mohanji. He answered participants’ questions with utmost clarity. The cleansing process began the moment participants met Mohanji and later during the Power of Purity meditation. The whole experience left people speechless from the overwhelming feeling of expansion in their hearts. I also enjoyed memorable afternoon advanced Yoga classes with Sanjay Sir. It took right about 4h after lunch before this session without food so that we could stretch properly. During the sunset, we went for a Conscious Walk along the beach, which was a very auspicious time for meditative walk. Splashing of waves and persistent stridulating of crickets started coming from the inside, not outside. Day 3 and 4 were real cleansing days with energy building up steadily. Some people felt sleepy from the high energy during lungs meditation that followed an exhaustive breathing routine. Some felt emptiness or levitation. Some felt synchronicity of lungs and the heart. Some felt very sad or jealous because these negativities were sitting in them and were pouring out. The release had begun accompanied with an inner mental conflict e.g. “Everybody else feels better than me“. On Day 5 Sunrise Yoga pushed our limits with 24 sun salutations as per Himalayan School of Traditional Yoga (HSTY) along with new asanas for stretches, strength and stamina. We did them at a moderate speed of 45 seconds/cycle, which was challenging for a few, but with the guidance of Sanjay Sir everyone completed the routine. He demonstrated how it looked to do it even in 24 seconds! In general, the experience of Sunrise Yoga was surreal, pure joy and bliss. I am grateful to Mohanji to have brought such a great Yogi, Sanjay Sir to Croatia and grateful to destiny to have brought me here, too. After Sunrise Yoga filled us with energy and freshness, we continued with 360° meditation. Hearts opened and tears starting rolling down. The Mantra chanting which followed had a further cleansing effect too intimate to show in public. We also listened to sacred music with vibrations directly touching the soul and opening up the heart. People felt like they were on a roller-coaster, and some claimed they were born again. Later, to top it all, Mohanji gave Satsang during which he related a wonderful story about a doctor who was a sincere seeker and was looking for a true guru. He went through many miraculous events with his conviction being severely tested. Ultimately, destiny brought him to Mohanji and he was finally initiated into Consciousness Kriya in the way his soul had asked for a long time. Releasing continues… During the satsang Mohanji reminded that every moment is completion of what we planned before birth. Even what situation seems to be the same, is never the same as it is a different day, moment, personality experiencing because you are dying every night and getting born every morning. What makes us negative are negative patterns – this is what we addressed during the retreat. When past gets released, life is new, there is a change in the path of destiny, you are fresh. It takes an environment like this, a master whom you trust, to create energy and vibration like this. All the time, He knew what was happening with each one of us on an unimaginably subtle level. On Day 6, he started addressing us in a determined and straightforward manner, without being asked questions. He explained about the foolishness of suicidal ideas and agonising consequences which this destructive inclination has on the soul’s journey. Why was he talking about this very topic? He pointed out that among the things people were releasing he had seen a few suicidal tendencies, guilt from abortions, over-protection and possessiveness or over-dependency. All these burdens were coming out of people and he had taken care of it. On the surface there was chanting, dancing, shouting, crying, laughing, groaning, moaning, etc. How could he know all these so precisely and even more, how did he handle it all? As he climbed up the terrace for the satsang, he addressed a lady at the entrance whom he had not met since morning “Was the cigarette good?” She was not even holding a cigarette in her hand. Smoking was not allowed, as we were supposed to go through detoxification and not intoxication! The fact that He wasn’t physically present did not prevent Him from knowing about the hidden smoker. As I was translating during one-to-one consultations, having finished one, he asked me, ”You didn’t go for a swim today?” “No, I didn’t” I said. “I took a nap.” He knew even that. As I returned home from the retreat, I thought about the significance of maintaining love in the heart, not directed at anyone in particular but remaining the invisible thread binding us all beyond perceivable existence. The taxi driver who was taking me back home, told me about a terrible and cruel murder that had happened in a nearby town. Five people had been killed and twenty injured. Twelve days of mourning had been declared because of that incident. He started to accuse, complain, get angry, be desperate and judge. Instead of getting depressed and angry with him, I told him we should forgive that man and pray he finds real happiness and peace within as he didn’t know how to love and overcome his frustration. We can pray to keep our heart clean and hope that the man will be jailed soon before hurting any more people. There is one sun and it shines on everyone, even on the murderers, and we should not poison our hearts with resentment and judgment nor should we hate even the worst criminal. The power of radiating love within is important for our own well-being. When directed only towards the Guru, it could be a double edged sword, as one can become attached to His form and crave for physical proximity. However, this never lasts as nothing from the earth can survive for long, including the relationship that arises out of attachment to a physical form of a Guru. Although it is directed towards the Guru, He has nothing from it nor does He need it instead He patiently nurtures that feeling in a disciple so that the disciple can grow. When a person gets stronger and more stable in love then everything else becomes less important. The most important thing becomes love within. We are the first ones who feel that love along with our surroundings. And of course, Guru feels it, too, yet His aim is that you shine and radiate first, so that you are the light to your surroundings. His aim is that you love yourself and hug yourself completely and to overflow this love on your fellow citizens. To kiss each event as a gift from God and to spread spiritual culture around. How? Not by preaching but by your own example. Not by renouncing the world, hating and alienating from it, but setting oneself free from the world within – to become free from attachment to worldly things, to become free from binding, limiting beliefs, self-imposed clamps, shackles that we were carrying unconsciously. His aim is that you recognise the difference between worldly and spiritual, transitory and permanent, mortal and immortal, dual and single, sensory and extrasensory, gross and subtle. Also, to accept the rules of terrestrial behaviour, e.g. “Born to pay“, as was written on one T-shirt. Let’s not take His love personally as we may become possessive and suffer (or leave like some did). He does a service to the society. When we shine more, the society shines more, too. When the retreat concluded, I was seeing people around me as if they were my old, faithful friends. As if we have known each other for at least a hundred years. I approached everyone with childlike trust and innocence. Although introvert by nature, I felt more open and free. People said, “You look like a girl” and I felt that way too. I felt a childlike, leaping playfulness, full of enthusiasm for new experiences, not craving for any but full of joy welcoming each divine new day. Mohanji loves us a million times more that we love ourselves or others as His capacity to love is a million times bigger. The key is not to expect from Him to give love while we are passive with an attitude of asking, demanding, needing, as if we miss something and would like to fill it with something from outside. Instead, we need to work on ourselves so that we can go deep within and see how much love we can radiate filled with Mohanji’s energy and blessings. This is a continuous effort and we can try to increase our capacity to love so much that we reach His capacity to love wherever we are. Reach that purity of the heart, purity of one Guru, one Brahmarishi, one Raja Yogi, a sage, a spiritual master. Forget ourselves for some time and be that love. Be Him. I love to see when people understand that Mohanji’s teaching is universal, beyond all concepts, embracing all religions and raising awareness to a level beyond all religions. Instead of a compartmentalized love, one should love everyone. The purpose should always be inner liberation from everything. And in order that happens, we should identify and become that immeasurable LOVE beyond all limits and boundaries and express it towards everyone who come to us. Also, instead of being passive, if we are proactive and take responsibility for our actions, the energy level also increases. When we connect with Mohanji every moment, we receive tremendous blessings and we must not take them for granted. We should recognise and validate these divine, precious gifts which our destiny or Guru principle sent to us. The ultimate consciousness has manifested into a living master who serves to bring dharma back to the Earth, and establish harmony with natural laws leading souls from darkness to light. Mohanji is here for the well-being of the Earth and elevates anyone who is honest, yearning to strive for a higher cause of love and immortality. When we radiate love, what is best comes to us without even asking.